Crabtree & Crabtree were crowned victorious in the recent Visit Kelso Easter Window Display competition. Judged by Margaret Livingston-Evans, General Manager at Ednam House, the winners will receive six complimentary Sunday lunches courtesy of the hotel. The Visit Kelso group ran the competition as part of their Easter celebrations. Alongside a treasure hunt and the Kelso Easter Opening, which involved local shops opening their doors to the public on Easter Sunday, the window display proved immensely popular amongst visitors. With such a variety of wonderful and visionary displays, judging the competition was a task not to be envied. Winner Crabtree & Crabtree’s display was themed ‘Easter in Wonderland’, which really captured the imagination of passers-by. Runner up was Swans Shoes who were awarded two afternoon teas at Ednam House. Judge Margaret said: “It was lovely to see so many shop owners taking part in the Easter Window Display competition and putting so much effort into their displays. 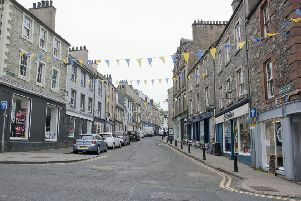 It really brightened up the town in the run up to Easter weekend.